Bee pollen is a substance for pharmaceutical and cosmetics industries. This is not by chance, as its composition is very rich and includes 35% carbohydrates, 20% protein, essential amino acids, enzymes and all B vitamins, beta carotene, vitamin C with anti-oxidant effect, vitamin D, having great importance for calcium metabolism of the organism and construction of human bones, vitamin E relevant for the potency of the organisms. Pollen also contains trace elements, growth hormone as well as other biologically active substances which composition is yet unknown. 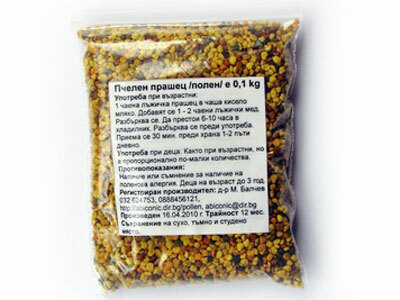 Application:Due to its rich composition and a prominent biological effect pollen is used as a food additive to increase the resistance of the body, as an aid in treatment of neurological disorders, as well as an agent in obstipation / constipation / in benign enlargement of the prostate gland / prostate adenoma / in inflammatory diseases of the prostate / prostatitis / in men, for boosting the immune strength of the organism and protection acute respiratory infections, etc. Adoption of half an ounce (0.359g) pollen a day satisfies the minimum needs of the human body for amino acids. The daily consumption of bee pollen can supply the body with necessary vitamins and trace elements. Scientific esearches on animals indicate the presence of not exactly identified substances, having prominent gonadotropic effect, affect the potency and accelerate the growth of organisms. Pollen has a regulatory function on intestinal activity and antibacterial effect, best expressed on Salmonella, Escherichia coli, Proteus. This makes it applicable in enteritis and other gastrointestinal diseases. Thanks to its tonic effects and afrodiziac activity it is successfully applied in cases of physical and mental stress. Some studies have shown a good effect on hypertension and liver diseases. The most prominent effect is prevention of hypertrophy of the prostate gland. Pollen is easily absorbed by the body. It is absorbed directly by the stomach. Two hours after application, the components of the bee pollen may be found in the blood, cerebrospinal fluid and urine. Method of extracting: We offer our clients pollen extracted by a special technology. Our pollen traps, which are special metal bars through which the bees pass and scraping their feet, the pollen balls fall into special drawers, are made of superinox. Superinox is expensive material, but more important is that it is completely inert and in this way pollen does not get into contact with extrinsic materials, thereby minimizing the possibility of foreign body to penetrate into it. Furthermore, the bottoms of the drawers are of reactive bars, which also mean that in our pollen the probability of penetration of alien substances is minimized. As by now the subsequent collection of bee pollen drying is carried out in a thermostat, which ensures the drying of pollen at temperatures below 42 degrees. This is important to keep the bioactive properties of pollen without which its use as a medicine loses its meaning. Additional cleaning by a moderate air flow removes from the final product the small and destroyed pollen grains, thus to our clients reaches pollen of an excellent quality and appearance. This is easily seen through the transparent packaging of our pollen. After collecting the bee pollen is stored in a dark place, in freezer, in which it retains fully its properties and prevents the development of vermin.